College can be hard and no one knows that better than Art. This long legged monster has become friends with the big monsters on campus like Mike and Sulley and is looking to have a great time with his scary palls. Now you can look just like mysterious monster with this Art accessory kit! Who is the greatest scarer in all of Monstroplis? That would be none other than James P. "Sulley" Sullivan! This monster has been at the top of his game ever since he graduated from Monster University. Now you can look just like the blue wonder with this adorable costume kit! Sullivan's the name, and scaring is the game. Transform into one of the top scaring monsters with this exclusive Adult Sullilvan the Monster Costume. Just watch out for cute little toddlers who are still awake when you arrive ... those are the hardest to scare. It's time to go out to do some scaring! Now your little one can look like Monsters University's top scarer when he zips into this Kids Monsters University Sulley Costume Hoodie. He'll be all set to join Mike Wazowski in scaring everyone around the MU campus this Halloween! 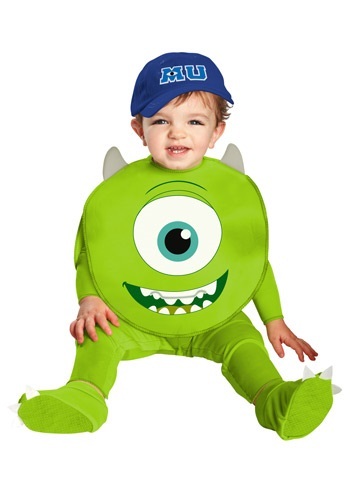 He'll be all set to enroll & matriculate at Monsters University in this Mike Classic Infant Costume! Add our Mike tote bag for collecting Halloween goodies. Going as a silly or funny monster this year? Keep your treats or other valuables safe with the help of Mikey the monster as your tote bag this holiday! The Oozma Kappa fraternity in Monster's University was supposed to be the super lame one compared to Roar Omega Roar, but we think it has a lot going for it. For example, it's in a really nice house, and Squishy's mom is totally awesome with the making of snacks and the pouring of soda for all the members. Game night? Forget about it! Looks super fun to us nerds, and how cool and wise is Don Carlton? We'd love to just ask him questions about real life. Art isn't bad either and seems like a blast to hang out with and just talk philosophy of scaring 101. So, we're not sure why the hate on Oozma Kappa by the other frats... we think it's the best one at MU! "You don't study scaring, you just do it. "When monsters want to become true scarers they need to get the proper degree and the best place to do that is at Monsters University. There you might even run into one the big monsters on campus known as James P. Sullivan, also known as Sulley. This furry blue fun loving guy loves to do two things, scare and party. Now your little one can look just like Sulley when he wears this mask that moves when he talks. There's two schools of thought when it comes to Sulley. To some, like monsters living in Monstropolis, he's the scariest thing they've ever seen and the best scarer at Monster's Inc. To others, like Boo, he's just a big kitty. 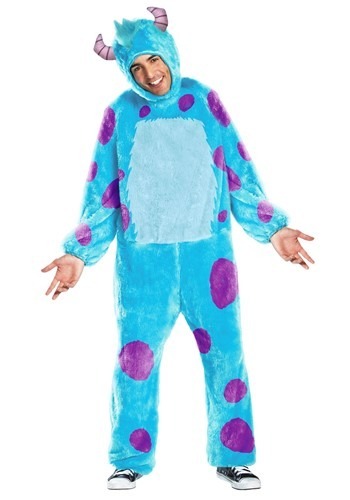 Here at HalloweenCostumes.com we like to think of Sulley as something in between. What's scarier than a giant blue and purple polka dotted monster with huge fangs? Not a whole lot! On the other hand, he is just a big fuzzy monster with purple polka dots and pleasant blue fur... we can't decide! Let's just say he's kinda of scary, but also kind of adorable. 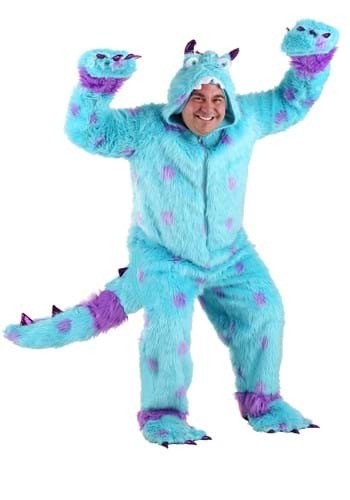 Become Sulley for yourself with this awesome costume and you too just might be an honor student at Monster's University. Goooo MU! BOO Scary Tech. Jumping out of closets and scaring the fright kid after kid--it can get tiring after a while. But with a few remedial classes, some good petting, and a little bit of adjustment therapy, you'll no longer have that instinct to frighten children. Or you could go the easier route with this Plus Size Sullivan the Monster Costume. He's a friendly monster that's perfect for group costumes! Sometimes even monsters need to take a break from the whole scaring thing. On their days off, they prefer to wear jeans and tees just like us. Be comfortable (or make a fun, and easy DIY costume) with this Sulley Headband. They grow up so fast. Just yesterday he was making scary faces in his crib, and now he's all ready to head off to Monsters University. 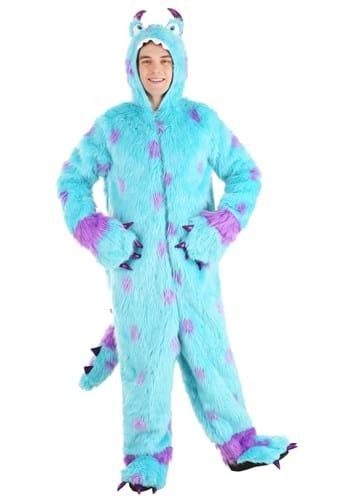 If you want your little monster to fit in with all the rest, he'd better be dressed up like Sulley, the coolest monster at the academy. Ready for another chance to scare? Get ready to jump out of the closet and scream, "Boo!" 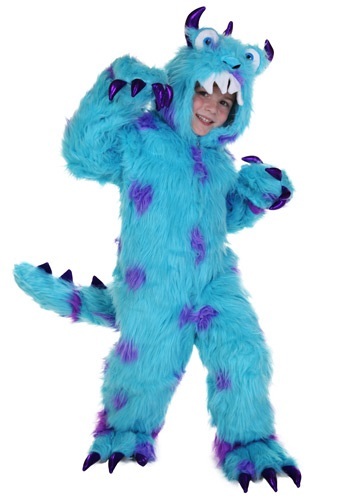 in this Sullivan the Monster Costume. Hopefully, you'll have better luck than the last guy. We thought this Sulley tee could make a great costume for young ones who are new to Halloween, and we also thought it would be a nice t-shirt to wear the rest of the year as well! Sulley is such a snugly fellow that he makes the perfect comforting subject for toddlers who might be a little spooked on their first night trick or treating. Get your scare on! Hide under the bed, hide under the chair, hide in the closet, and jump out and scream at the best time. Now you can scare all the little kiddies when you wear this Tween Mikey Shrug Set. Team up with the big and tall blue furry monster and let the antics begin!